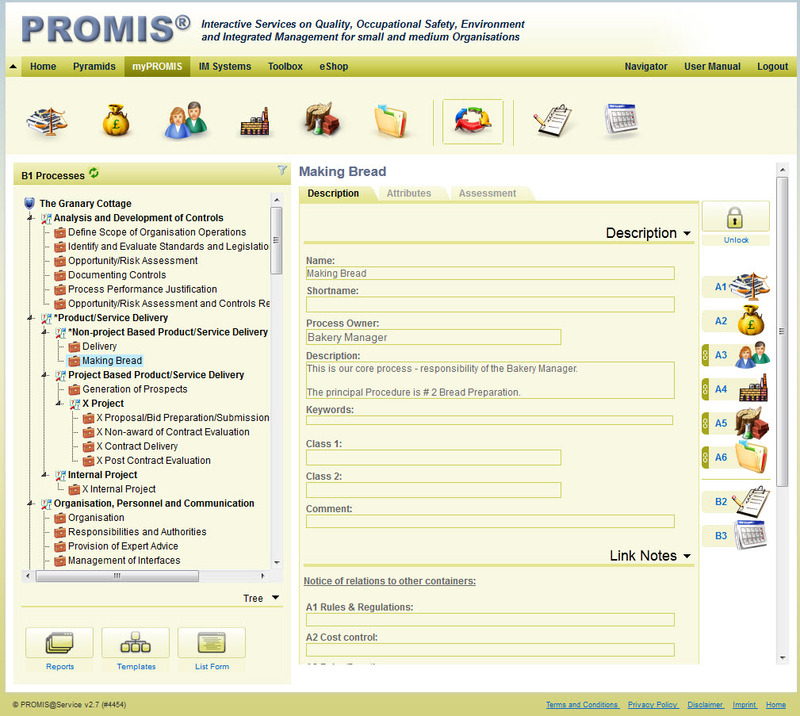 The PROMIS® software-as-a-service solution comprises several interactive services and consulting functions which are offered with the support of institutions, as well as regional selected PROMIS® qualified consultants and are based among others on the provision of continuously updated tailored content, and selected information dissemination. The core of the PROMIS® service is the online integrated management solution. This application supports and integrates compliance with legislation and management systems in a user-friendly format that accommodates organisations of all sizes and sectors. Here organizations can, with online consultancy support, define and improve their processes link them with related information or records of other aspects such as documents, raw materials, equipment, personnel etc, and manage them in accordance with legal and internal organizational requirements. 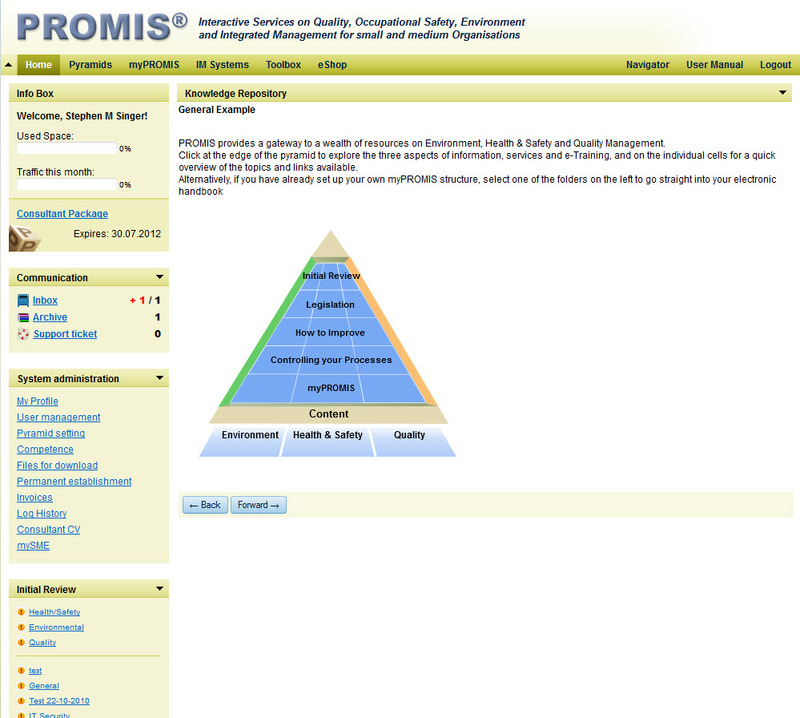 ‘myPROMIS®’ supports all the stages of implementing a management system, automatically documenting the outcome in an electronic handbook which follows ISO, EMAS, OHSAS and other requirements. At all levels, SME users are offered the opportunity to get the support of a qualified PROMIS® consultant. The pyramid allows structuring, filtering and sharing experience among consultants and SMEs from a sector (e.g. Construction) and/or theme (e.g. Maintenance) and/or domain (e.g. Health&Safety). This module is based on the concept of sharing experience via a system of pyramids which can be customized at will, for any type of sector, theme and domain application to serve specific sectoral needs of small organisations. Consultants and associations can structure the pyramid with specific content or direct links to institutional knowledge and legislation which they consider helpful to their own clients. The pyramid structures information, multimedia content, eTraining and links to external databases. These can be linked directly to the integrated management containers of myPROMIS®, providing enormous added value based on the fact that employees receive the answer to their questions at ‘a fingertip’. This opens the door to a wide range of applications. The first four levels make up myKnowledge. Is a fully integrated tool for focused communication between consultants and their clients. It includes the option of direct access to a client’s working environment, subject to comprehensive access controls. Is the tool which allows to conceive, elaborate and verify any kind of questionnaire; to adapt it to the own requirements and the needs of the own customers.